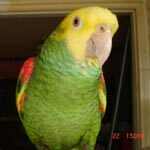 Parrot Forum • View topic - Why does Chance call me by her name? Do birds know their own names? I thought they did. Why is it that Chance sometimes calls me by her name? Re: Why does Chance call me by her name? Well, just because she uses the name Chance when you are around doesn't necessarily mean that she doesn't consider it her name. The whole thing depends on how and when you teach them their names. For what I have read in studies on their vocalizations, baby parrots learn their names when they are in the nest but, in captivity, because the name-learning age window is much earlier than when we get them and breeders don't name them, they can get confused -which doesn't mean they can't learn the name we give them as their own, only that it's not a sure thing because it depends on how you teach it. See, the thing is that parrots announce themselves to others by using their proper name [kind of like a person who walks into a house and says: "It's me, Tom!" so, if we use a name when we first approach them [from another room because it has to be at a point when we are not there and then we are and approaching them], they would assume that is our name and not theirs. Linus Too, for example, thinks his name is "Hi, Linus!" and that humans are "Hello!" But she could be using Chance as her name because they also use their name to call attention to themselves [Javi does this all the time] as in "Come to Chance! Chance is here!" so she could be using her own name to ask you to pay attention to her. Myrtle calls me by her own name when she is trying to tell me to pay attention to her for something. When I am eating and not sharing she will get on my shoulder and say Myrtle in a soft voice as if to say Myrtle wants some. Chance may be using her own name to tell you that Chance wants something.